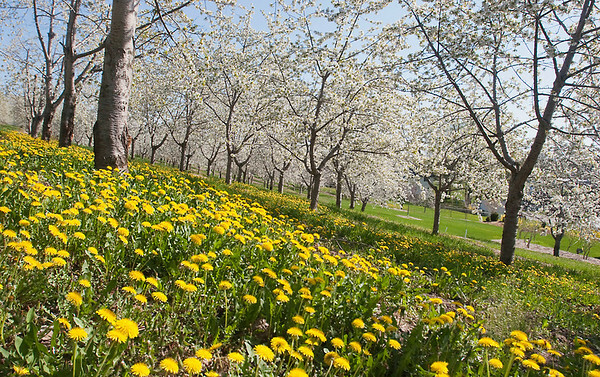 Sweet cherry trees and dandelions are in bloom along M-22 in Leelanau County, just south of Suttons Bay. According to the Leelanau County MSU Extension service, apricot trees bloom first, followed by sweet cherry, tart cherry and apple trees. A high-pressure system that will settle over the region on Sunday will bring with it the potential for frost Sunday night into Monday morning, the National Weather Service in Gaylord reported. The weather service will wait until Sunday afternoon to determine if it should issue a frost advisory.